Zorphbert & Fred by Dawn Griffin - 2011 Baltimore Comic Con! Be there! 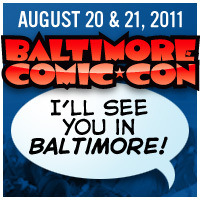 2011 Baltimore Comic Con! Be there! Baltimore is becoming one of my staple conventions, and one of my favorites! I love how the atmosphere is geared towards comics, instead of Hollywood pop culture like the bigger conventions such as the monstrous San Diego. Getting back to the basics! It certainly bodes well for aspiring creators like myself, attendees are just more open to checking out new material! Plus more stuff like sketchcards, buttons, pendants & signed prints… and always willing to do commissions as well! Stop by! Bring me a coffee w/ cream & sugar, and you get a free sketchcard and a set of buttons!!! Cuz, I’ll be needing a coffee, most likely. Oct 9, 2010 NYCC Live Photo Blog!